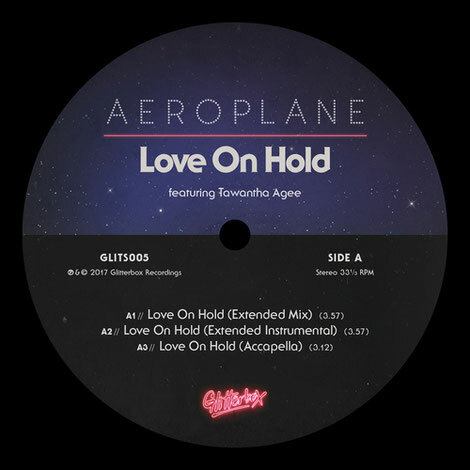 Sounding like something to come out of Solar Records in 1984, ‘Love On Hold’ embraces Aeroplane’s typically exquisite attention to detail, resulting in a blend of disco, ‘80s funk and boogie. The track also features backing vocalist, Tawatha Agee, who was also the voice of legendary funk band Mtume, singing on their 1983 classic ‘Juicy Fruit’. The credentials of Tawatha’s richly poised voice coupled with Aeroplane’s composition make for an interesting release. After a digital release which reached overall Traxsource #1, the ‘Extended Mix’ of Aeroplane’s track is now being available on 12”, along with an ‘Extended Instrumental’, ‘Accapella’ and two edits from the master of disco re-rubs, Dimitri From Paris. Both extended versions, Dimitri’s ‘Instrumental’ and ‘Re-Touch’ explore the versatility of the track for DJ use.